Cedar of Lebanon (Cedrus libani) is an ecologically and economically important conifer with a natural distribution in southern Turkey. Currently, no serious diseases affect C. libani in its native range, although it is susceptible to pathogens such as Heterobasidion annosum and Diplodia pinea in inoculation experiments (Lehtijärvi et al., 2011). Recent reports from the Balkans and Northern Europe, however, suggest that C. libani is susceptible to foliage and shoot diseases such as Diplodia pinea, Dothistroma septosporum and Sirococcus tsugae (Mullet et al., 2016; Zlatkovic et al., 2016). During disease surveys in July 2017 in the Atatürk Arboretum, İstanbul (41°10'30.53"N, 28°59'5.22"E), dieback was observed on branches of a young C. libani (Fig. 1). 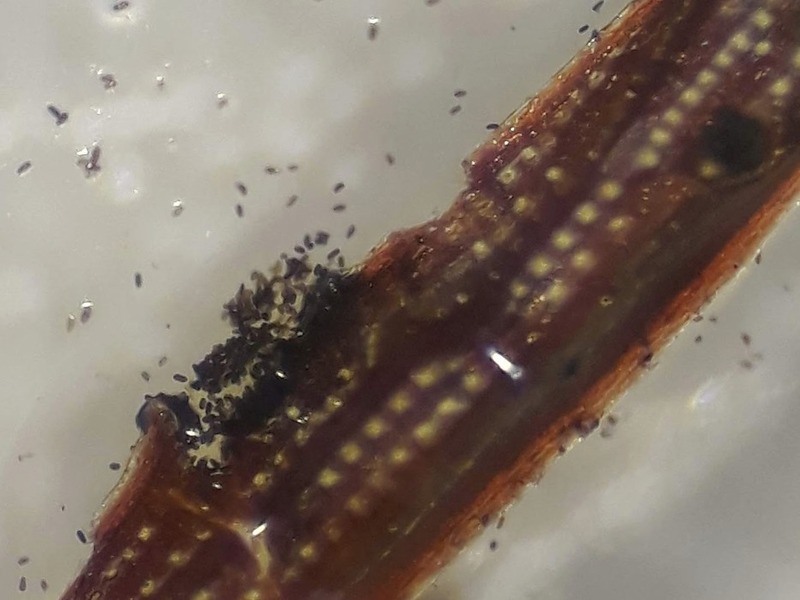 Abundant black pycnidia were observed on dead needles under a binocular microscope (Fig. 2). Examination under a compound microscope revealed the presence of non- or one-septate, light to dark brown, oblong-ellipsoid conidiospores, characteristic of the genus Diplodia (Figs. 3-4). Isolations were made by plating spore masses onto 2% malt extract agar in 90 mm diameter Petri dishes under aseptic conditions and incubating at room temperature for ten days in the dark. Blackish-dark grey colonies with grey aerial mycelia were subcultured on 2% malt extract agar covered with cellophane membrane and incubated as described above. DNA was extracted from mycelia using an E.Z.N.A. fungal DNA extraction kit (Omega Bio-tek, USA) and amplified by PCR using species-specific primers for both D. pinea and D. scrobiculata (Smith & Stanosz, 2006). The D. pinea primers amplified a product of 700 bp. The ITS region was also amplified and sequenced (White et al., 1990), and the sequence of a representative isolate was deposited in GenBank (Accession No. MH368280). Comparison of the ITS sequences obtained from C. libani showed 100% nucleotide identity with those of reference strains of D. sapinea (e.g. NR_152452.1). Inoculations were made on two-year-old C. libani plants to determine the pathogenicity of the fungus, with five replicate plants each for stem and shoot inoculations. A circular 4-mm wound was made on stems approximately 10 cm above the root collar, by removing the bark tissues with a surface-sterilised cork borer. For shoot inoculations, a small wound of c. 3 mm was made on the shoots using a scalpel to remove the bark, at c. 5 cm from the tip of the terminal shoot. Agar plugs (4 and 2 mm diameter for stem and shoots, respectively) taken from the margins of an actively growing D. sapinea colony on potato dextrose agar (PDA), were placed mycelium-side onto the wounds. All treatments were wrapped in plastic paraffin film. Controls (three replicates for both stem and shoot inoculations) were wounded, as described above, and treated with sterile PDA plugs. All plants were incubated at 24°C for eight weeks in a climate chamber. Following incubation, dieback symptoms were observed on all inoculated plants; foliage and stems were dead above the inoculation point (Fig. 5). Lesion extension towards the root collar was 24.2 ± 2.0 mm for stem and 26.0 ± 1.16 mm for the shoot inoculations. The pathogen was successfully re-isolated from symptomatic stem and shoot tissues, thus fulfilling Koch's postulates. To our knowledge, this is the first report of Diplodia sapinea causing dieback on C. libani in Turkey. 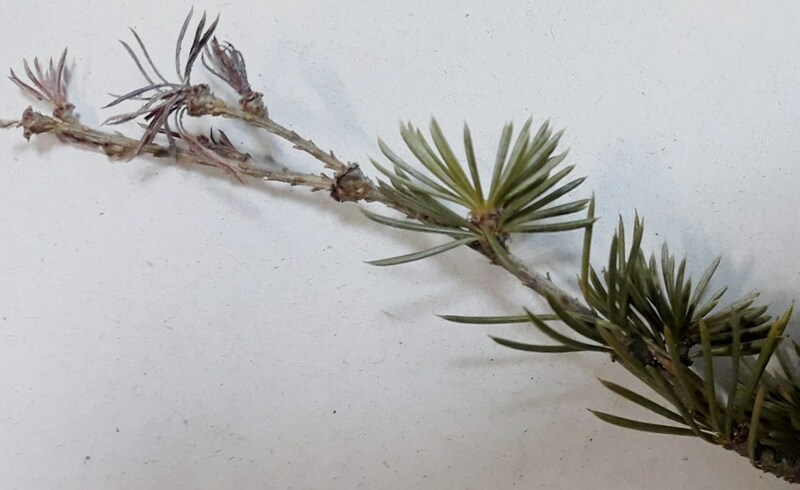 Figure 1: Shoot tip dieback symptom on a Cedrus libani shoot. 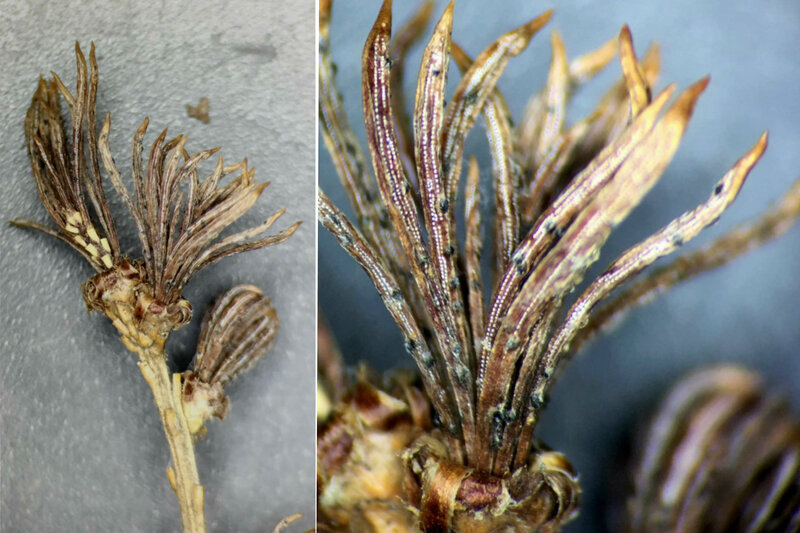 Figure 2: Abundant black pycnidia of Diplodia sapinea on dead needles of Cedrus libani. Figure 3: Pycnidium on a dead needle of Cedrus libani releasing conidiospores of Diplodia sapinea (×4 magnification). 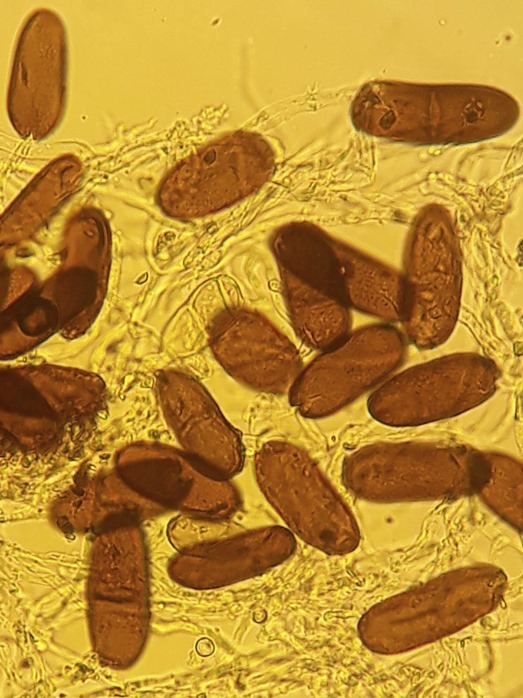 Figure 4: Non- or one-septate, light to dark brown, oblong-ellipsoid conidiospores of Diplodia sapinea (×40 magnification). 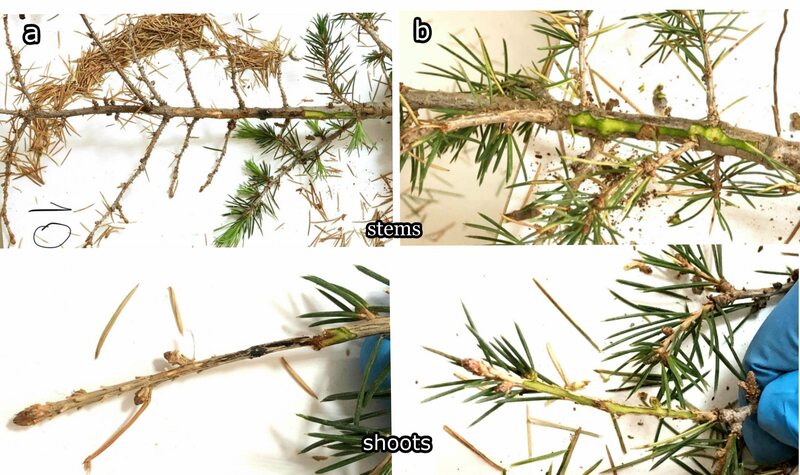 Figure 5: Symptom development on inoculated Cedrus libani stem and shoot eight weeks after inoculation (a), controls (b). Financial support from the Süleyman Demirel University (Project No.4984-GÜP-17) is gratefully acknowledged.